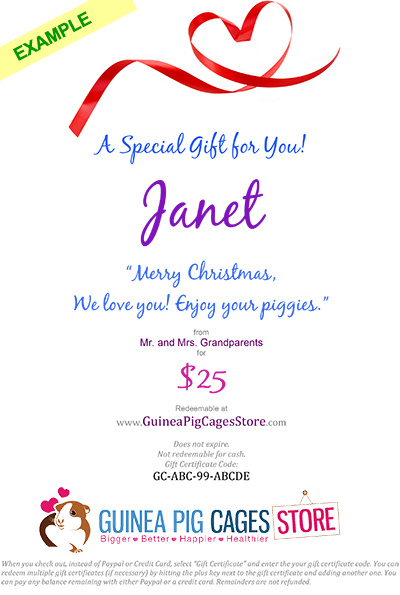 $100 Gift Certificate for the Guinea Pig Cages Store. We will deliver the gift certificate on your behalf via email upon purchase if you provide their email address. Otherwise we will email it to you to pass on to them. The recipient of the gift certificate will see your gift note, the dollar amount, and simple instructions to redeem it. Please remind the recipient to check their spam folder to make sure your gift does not get lost. Please make sure you have your gift recipient's email address spelled correctly. If you don't want an immediate email sent to the recipient, don't fill in their email address. You will receive an email with all of the relevant information. You can send them the email when and how you desire. In addition, if you enter their mailing address, we'll send a nice coupon document to them in the mail to the address you indicate, whether it's to you or directly to them. When redeeming, remaining balances are not refunded. Additional payment can be made with the Gift Certificates for overages. Multiple Gift Certificates can be redeemed on one order.